I first became acquainted with the Kenwood/Hyde Park area as many people have, via the infamous Leopold and Loeb case, now nearly 100 years old. I took a walking tour as part of the Chicago Historic Museum and I have been returning to the area since, at times without any real reason. I was surprised to find that there was a record store in my midst as I jaunted around the neighboorhood during my visits. I rose early to head down south and see what I could find. 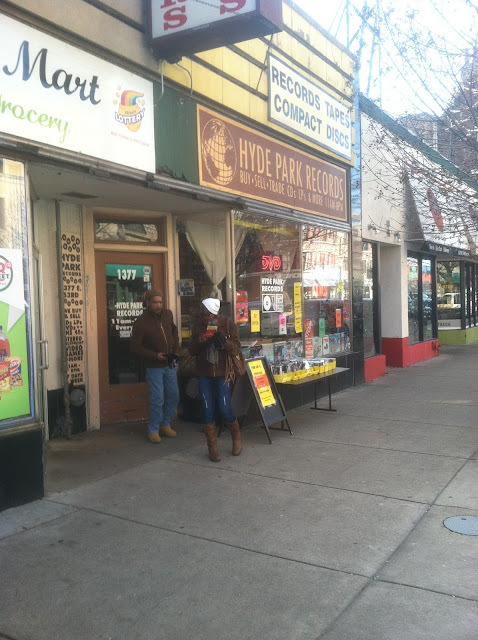 Many parallels can be drawn between this store and Dusty Groove: both specialize in jazz, soul and largely shun other genres. 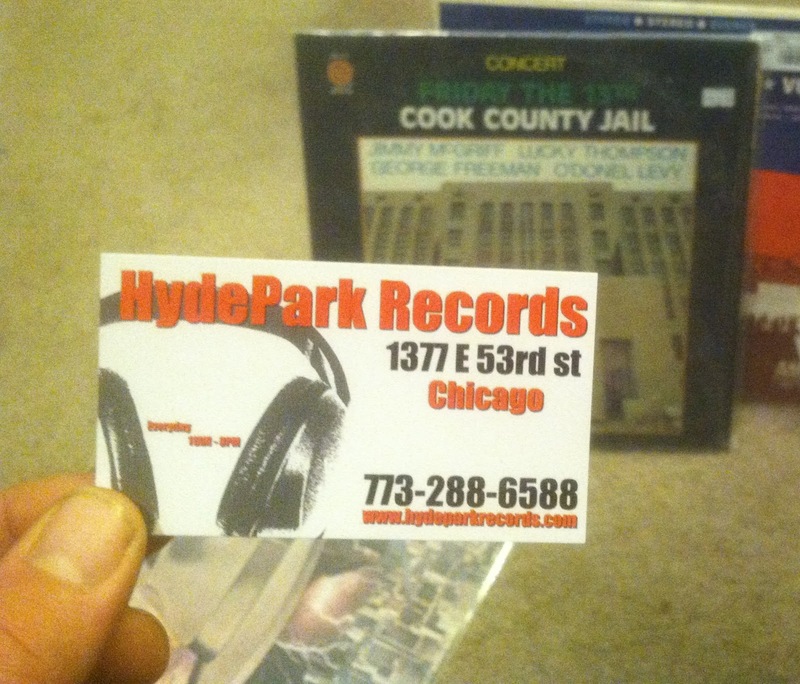 However while Dusty Groove is far more narrow minded in that regard, Hyde Park Records shows far more lenancy. They do stock some 'rock' records and have a huge trove of 99 cent mixed style records of varying qualities - Dusty Groove would never bother with such trifles. 1) John Coltrane - 'Giant Steps'. I recently bought the reissue to replace my simple 70s "That's Jazz" copy but I still have a hankering for a real Atlantic release from the 60s or earlier. The quality and price did not jive with me, especially considering I just threw down $50+ on a 180gram copy. 4) Airto Moreria - "Identity" I come across this record seemingly ALL THE TIME and its driving me to madness. I don't know that I'll love it but surely I love Airto's work....why does this record haunt me everywhere I go??? I initially saw the release I was destined to bring home but after an extended look I put it away. Then a short time later I had the revelation that I MUST have that album...and of course someone was in that section. Like an amphetamine addled maniac I tried to look elsewhere while regularly jerking my head in the direction of 'JAZZ MISC F' to see if I had my 'in' available. 4) recorded on Friday the 13th! 'Friday the 13th - Cook County Jail' is actually an excellent record with some staggering guitar work that jumps out - interesting since Jimmy McGriff gets top billing and he is known for his work on the Hammond. Soul-Jazz is not a genre I am fully familiar with and I do not believe I have any other releases in my collection that would fall into this style but it surely appeals to me. The best kind of find is the one you were not looking for but end up so pleased with. I spent about 25 minutes looking through the lower bins full of 99 cent releases and was very tempted to grab a MINT copy of Wham! 'Make It Big' with zero ironic intent (that is some great pop music) but decided mp3s will suffice. All of that aside, the best new music I discovered may be the one I did not take home. 5 minutes into my diggin', I had to approach the counter and ask what they were pumping through the speakers. It was the catchiest jazz I've heard in a minute: it had an ethnic flavor, funk and fusion elements and it was addictive. They showed me the CD - they did not have it on vinyl (I looked) - so I downloaded it when I got home. It has been on serious rotation since and shows no signs of slowing down.